In September of 2012, former BNI football players from the 50's through the 90's held a special reunion to pay tribute to Hall of Fame member and former BNI head football coach Jerry Vlasic. These former players recognized a need to support the current athletic program and pay tribute to a beloved coach. The Lettermen Locker Room Challenge is raising the funds necessary to completely renovate the boys locker room in the BNI fieldhouse. In February, 2015, Vince Berta '76 offered a challenge to former athletes - he would match all donations up to $10,000 made by June 1, 2015. Our Warriors met this challenge in true style raising $10,500! New lockers, paint, lighting and floors were completed in February, 2016. Future enhancements will include plumbing, showers and vent work. If you missed the challenge, you can still help! Please consider supporting our current BNI Lettermen by contributing today. All donors will be recognized on a plaque outside of the renovated locker room. 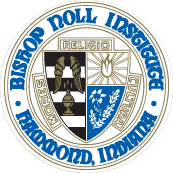 Please lend your support today for all that Bishop Noll has done for you. C'mon Warriors, accept the challenge today!